And it's finally here, Black Friday brings the opening of the holiday shopping season and there are tons of deals to be had, but our recommendation first and foremost is to only shop for items that you needed or were wanting to buy in the first place, but now for a good discount. 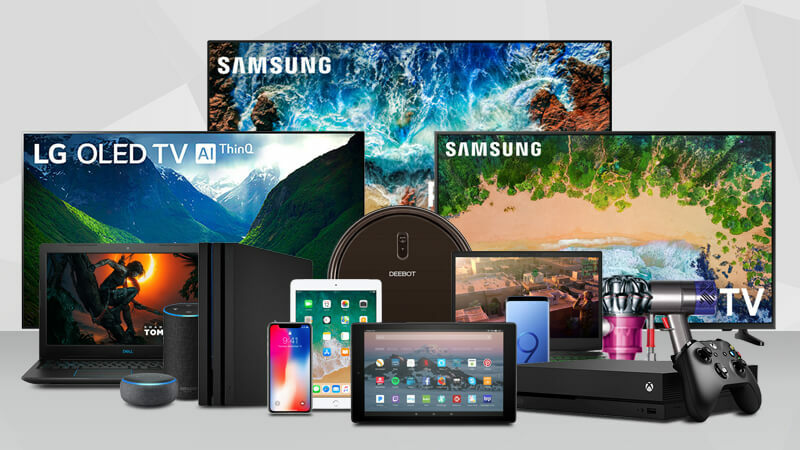 • Featured • PC Components and Networking • HDTV and Entertainment • Gaming • Laptops and Desktop PCs • Smartphones • Monitors • Amazon Devices • Smart Home • Electronics • Headphones and Audio. 50" Toshiba Fire TV 4K UHD HDR Smart LED HDTV for $299.99 at Amazon (list price $400). Linksys Velop AC4600 Tri-Band Wireless WiFi Mesh Router (3-Pack) for $199.99 at Walmart (list price $349). In and out of Stock: Apple iPad 32GB WiFi Tablet (Latest Model) for $249 at Walmart and Amazon (list price $329). In and out of Stock: Nintendo Switch with Mario Kart 8 Deluxe for $299 at Walmart and Amazon (list price $359.99). In and Out of Stock: Sony PlayStation 4 Slim 1TB Console Spider-Man Bundle for $199 at Walmart (list price $319). LG gram laptops (available in 13, 14, and 15 inch models) with fingerprint scanner, multiple ports (including Type-C), Intel 8th-gen processors, and an FHD IPS display up to $300 off. Today Only: SanDisk Ultra 400GB MicroSDXC Card with Adapter for $79.99 (200GB for $30, 128GB for $20) at Amazon (list price $249.99). WD My Passport 2TB USB 3.1 Portable SSD for $299.99 at Amazon (list price $699.99). Today Only: WD Elements 6TB USB 3.0 Desktop External Hard Drive for $99.99 at Amazon (list price $189.99). Google Home Hub Smart Display + 6mos YouTube Premium + $10 Vudu Credit for $99 at Walmart (list price $149). Google Home Mini Smart Speaker for $25 at Walmart (list price $49). Amazon Echo Dot 3rd Gen + Amazon Smart Plug for $29 at Amazon (list price $74.98). Amazon Fire TV Cube 4K HDR Streaming Media Player for $59.99 at Amazon (list price $119.99). Nest Hello Smart WiFi 1600x1200 HD Video Doorbell for $179 at Walmart (list price $229). Bose SoundSport Wireless In-Ear Headphones for $99 at Walmart (list price $149). Sony WH1000XM2 Premium Noise Cancelling Wireless Over-Ear Headphones for $198 at Amazon (list price $349.99). Today Only: Segway ES4 KickScooter Ninebot Electric Scooter (28 mile range, Up to 18.6mph) for $582 at Amazon (list price $949). Amazon Music Unlimited 3-Month Subscription (New Subscribers Only) for $0.99 at Amazon (list price $23.97). Kindle Unlimited 3-Month Membership (New Users Only) for $0.99 at Amazon (list price $29.97). AMD Ryzen Threadripper 1950X 16-Core/32-Thread Desktop Processor for $549.99 at Amazon (list price $799). Today Only: WD My Passport 512GB USB 3.1 Portable SSD for $94.99 at Amazon (list price $159.99). Samsung 970 EVO 1TB NVMe PCIe M.2 Solid State Drive for $227.99 at Amazon (list price $299.99). Samsung 860 EVO 1TB 2.5" SATA Solid State Drive for $127.98 (500TB for $73) at Amazon (list price $199.99). Today Only: SanDisk SSD PLUS 1TB SATA III 2.5" Internal SSD for $119.99 at Amazon (list price $249.99). Today Only: SanDisk Ultra 2TB SATA III 2.5" SSD for $255.99 at Amazon (list price $381.59). Netgear Nighthawk R7450 AC2600 802.11ac Smart Gaming Router for $99.99 at Walmart (list price $199). Samsung EVO Select 128GB microSDXC Card with Adapter for $19.99 at Amazon (list price $41.99). SanDisk Ultra Flair 128GB USB 3.0 Flash Drive for $19.99 at Amazon (list price $25.99). Norton Security Deluxe Software (5-Devices, 15 Months) for $19.99 at Amazon (list price $79.99). 55" Vizio P55-F1 4K UHD HDR Smart LED 120Hz Native HDTV for $648 at Walmart (list price $798). 60" Vizio D60-F3 4K UHD HDR Smart LED HDTV (2018 Model) for $498 at Walmart (list price $698). 55" Samsung UN55NU8000 4K UHD Smart LED HDTV (2018 Model) for $747.99 at Walmart (list price $1399.99). 75" Sceptre U750CV-U 4K UHD LED HDTV for $759.99 at Walmart (list price $1799.99). Nvidia Shield TV 16GB 4K HDR Streaming Media Player with Remote for $139.99 at Amazon (list price $179). Google Chromecast Ultra 4K Streaming Media Player for $49 at Walmart (list price $69). Google Chromecast 3rd Gen Streaming Media Player for $25 at Walmart (list price $35). Roku Ultra 4K Streaming Media Player with Voice Remote and Premium JBL Headphones for $49.99 at Amazon (list price $99.99). Yamaha RX-V683BL 7.2ch MusicCast Dolby Atmos Bluetooth AV Receiver for $329.95 at Amazon (list price $649.95). Pioneer VSX-1131 7.2-Ch MCACC AV Receiver with Dolby Atmos, 2x HDMI Out for $229.99 at Amazon (list price $329). Epson Home Cinema 2150 1080p 2500 Lumens Miracast 3LCD Projector + $50 Amazon Gift Card for $699 at Amazon (list price $899.99). Sony Playstation Plus 12-Month Membership (Digital Download) for $39.99 at Walmart and Amazon (list price $59.99). Sony PS4 DualShock 4 Wireless Controller (Various Colors) for $39 at Walmart (list price $59.99). Microsoft Xbox One Wireless Controller for $39 at Amazon (list price $59.99). HTC Vive Pro VR Headset for $699 at Walmart (list price $799). HTC Vive Pro VR Complete System for $1199 at Walmart (list price $1399). Star Wars Jedi Challenges AR Headset with Light Saber and Tracking Beacon for $49.99 at Walmart (list price $199.99). Microsoft Xbox One X 1TB Console for $399 at Walmart (list price $499.99). Microsoft Xbox One X 1TB Fallout 76 Console Bundle for $429 at Walmart (list price $499.99). Microsoft Xbox One X 1TB NBA 2K19 Console Bundle for $429 at Walmart (list price $499.99). Microsoft Xbox One X 1TB PUBG Console Bundle for $429 at Walmart (list price $499.99). Microsoft Xbox One S 1TB Battlefield V Console Bundle for $229 at Walmart (list price $299). Microsoft Xbox One S 1TB NBA 2K19 Console Bundle for $229 at Walmart (list price $299). Microsoft Xbox One S 1TB Forza Horizon 4 Console Bundle for $229 at Walmart (list price $299). Microsoft Xbox One S 1TB PUBG Console Bundle for $229 at Walmart (list price $299). Microsoft Xbox One S 1TB Minecraft Creators Console Bundle for $199 at Walmart (list price $299). Playstation VR Headset Bundle + Creed: Rise to Glory Game Bundle for $249 at Walmart (list price $299). Amazon Fire TV Game Controller with Alexa Voice Search for $14.99 at Amazon (list price $49.99). $50 Price Drop: Dell G5 15 Intel Core i5-8300H Quad-core 15.6" 1920x1080 Laptop with 6GB GTX 1060 Max Q, 16GB RAM, 256GB SSD + 1TB HDD for $849 at Walmart (list price $1099). $50 Price Drop: Dell G3 Intel Core i7-8750H 6-Core 15.6" 1920x1080 Gaming Laptop with GTX 1050 Ti, 128GB SSD + 1TB HDD for $699 at Walmart (list price $1099.99). Another $50 Price Drop: HP Pavilion 15 Intel Core i7-8750H 6-Core 15.6" 1920x1080 IPS Laptop with GTX 1060, 16GB Optane Memory for $749.99 at Walmart (list price $999.99). Dell XPS 15 (9570) Intel Core i7-8750H 6-Core 15.6" 1920x1080 Laptop with 512GB SSD, 16GB RAM, GTX 1050 Ti for $1399.99 at Dell (list price $1709.99). Dell Inspiron 15 7000 Intel Core i5-8250U 15.6" 1920x1080 IPS Win10 Pro Laptop with 256GB SSD, MX150 GPU for $699.99 at Dell (list price $899.99). Dell Inspiron 15 7000 Intel Core i7-8550U 15.6" 1920x1080 IPS Win10 Pro Laptop with 128GB SSD + 1TB HDD, MX150 GPU for $799.99 at Dell (list price $1069.99). Dell Latitude 15 3590 Intel Core i7-8550U Quad-Core 15.6" 1920x1080 Win10 Pro Laptop for $799 at Dell (list price $1384.28). MSI GL63 Intel Core i7-8750 6-Core 15.6" 1920x1080 Gaming Laptop with 6GB GTX 1060, 16GB RAM, 256GB SSD + 1TB HDD, CoD Black Ops 4 for $999 at Walmart (list price $1499). $500 Price Drop: Gigabyte Aero 15X Intel Core i7-8750H 6-Core 15.6" 3840x2160 144Hz Gaming Laptop with GTX 1070, 16GB RAM, 512GB SSD for $1799 at Walmart (list price $2049). SkyTech Shadow Mini AMD Ryzen 2600 Gaming Desktop with 4GB Radeon RX580, 500GB SSD for $619 at Walmart (list price $999.99). Dell Precision 3000 Intel Core i7-7700 Quad-Core Workstation Desktop for $606.09 at Dell (use code: SAVE45 - list price $1102). Dell Optiplex 3050 Intel Core i5-7500 Quad-Core Win10 Pro SFF Desktop for $579 at Dell (use code: EXTRA50OFFDT - list price $1042). Dell Optiplex 3050 Micro Intel Core i5-7500T Quad-core Win10 Pro Compact Desktop for $539 at Dell (use code: EXTRA50OFFDT - list price $984.14). Microsoft Surface Go Intel Pentium Gold 10" 1800x1200 Touch Tablet with 4GB RAM, 128GB Storage for $449 (8GB/128GB $499) at Amazon (list price $499). Today Only: Acer Aspire E 15 Intel Core i3-8130U 15.6" 1920x1080 Laptop (6GB RAM, 1TB HDD) for $319 at Amazon (list price $379). Today Only: ASUS Vivobook F510UA Intel Core i5-7200U 15.6" 1920x1080 Laptop for $439 at Amazon (list price $509.99). Today Only: ASUS Vivobook S Intel Core i7-8550U Quad-Core Thin 14" 1920x1080 Laptop with MX150 GPU, 256GB SSD for $699 at Amazon (list price $799). Dell Inspiron 11 Intel Celeron N3060 11.6" 1366x768 2-in-1 Chromebook for $199.99 at Dell (list price $279.99). Samsung Galaxy Tab S4 64GB Octa-Core WiFi 10.5" 2560x1600 Super AMOLED Android Tablet with S Pen for $547.99 at Walmart (list price $649.99). Samsung Galaxy Tab S3 32GB 9.7" 2048x1536 Android Tablet with S Pen + $50 Dell Gift Card for $399.99 at Dell (list price $549.99). Samsung Galaxy Tab S2 32GB 8.0" 2048x1536 Tablet for $287.99 at Walmart and Amazon (list price $399.99). Samsung Galaxy Tab A 16GB 10.1" 1920x1200 WiFi Android Tablet for $157.99 at Amazon (list price $279.99). Intel NUC Kit Intel Core i5-8259u Bean Canyon Mini PC for $299.99 at Amazon (list price $399). Intel NUC Kit Intel Core i7-8559u Bean Canyon Mini PC for $379.99 at Amazon (list price $517). Samsung Galaxy S9+ 64GB Unlocked Smartphone for $639.99 at Walmart and Amazon (list price $839.99). Samsung Galaxy S9 64GB Unlocked Smartphone for $519.99 at Walmart and Amazon (list price $719.99). Samsung Galaxy Note 9 128GB Unlocked Smartphone for $799.99 at Amazon (list price $999.99). Samsung Galaxy S8 64GB 5.8" 2960x1440 Unlocked Smartphone for $449.99 at Amazon (list price $599.99). Apple iPhone X 256GB Unlocked Smartphone (Refurb) for $809.99 at Amazon (list price $949). Prime Exclusive: LG V35 ThinQ 64GB 6" 2880x1440 QHD+ OLED Octa-Core Unlocked Smartphone for $549.99 at Amazon (list price $899.99). Prime Exclusive: Motorola Moto G6 64GB 5.7" Octa-core Unlocked LTE Smartphone for $229.99 at Amazon (list price $299.99). Prime Exclusive: LG Stylo 4 32GB Octa-Core 6.2" 2160x1080 Unlocked Smartphone with Stylus for $179.99 at Amazon (list price $299.99). Samsung F395 32" 1920x1080 Curved LED Monitor for $168 at Walmart (list price $389.99). Dell UltraSharp U3415W 34" 3440x1440 Curved IPS LED Monitor for $579.99 at Dell (list price $999.99). Dell D3218HN 32" 1080p Ultra-wide IPS LED Monitor for $149.99 at Dell (list price $349.99). Early Black Friday Deal: Dell SE2717HR 27" 1080p FreeSync IPS LED Monitor for $119.99 at Walmart (list price $199). Doorbuster: Dell S2716DG 27" 144Hz 2560x1440 G-Sync Gaming Monitor for $399.99 at Dell (list price $799.99). Dell U2715H UltraSharp 27" 2560x1440 IPS Monitor for $329 at Amazon (list price $429.99). Samsung UH750 28" 4K UHD QLED Monitor for $329.99 at Amazon (list price $499.99). Samsung CHG90 49" 1ms 144Hz 3840x1080 QLED HDR Curved Gaming Monitor with AMD FreeSync 2 for $899 at Amazon (list price $1099.99). Up to $80 off Apple Watch Series 3 Models (GPS 42mm $229, GPS + Cellular 38MM $299) at Amazon. Fitbit Versa Smartwatch and Activity Tracker for $149 at Walmart (list price $199). Samsung Galaxy 46mm Dual-Core Smartwatch for $279 at Walmart and Amazon (list price $349). Samsung Galaxy 42mm Dual-Core Smartwatch for $259 at Walmart and Amazon (list price $329). Garmin Fenix 5X Sapphire Edition Multi-Sport Training GPS Watch for $499.99 at Walmart and Amazon (list price $649.99). DJI Mavic Air Fly More Combo for $899 at Walmart and Amazon (list price $999). GoPro HERO7 Silver 4K Waterproof Action Camera for $229 at Amazon (list price $299.99). GoPro HERO7 White 1440p Waterproof Action Camera for $179 at Amazon (list price $199.99). Anker PowerWave 7.5W Qi Charging Stand + 10W QC 3.0 AC Adapter for $34.99 at Amazon (use code: ANKER002 - list price $49.99). Anker PowerPort Wireless 10W Qi-Certified Ultra-Slim Wireless Charging Pad (No AC Adapter) for $15.39 at Amazon (use code: ANKER001 - list price $21.99). Logitech C922x Pro 1080p Stream Webcam for $49.99 at Amazon (list price $99.99). Logitech MX Master Wireless Bluetooth Mouse with Darkfield Sensor for $49.99 at Amazon (list price $99.99). Amazon Echo Dot 3rd Gen for $24 at Amazon (list price $49.99). Amazon Echo Dot 3rd Gen + Fire TV Stick for $48.99 at Amazon (list price $89.98). 3rd Gen Amazon Echo Dot Smart Speaker + Sengled Color Smart Lighting Kit for $79.98 at Amazon (list price $129.98). Amazon Fire TV Recast Over-The-Air 500GB DVR Device with Alexa Remote for $179.99 (1TB DVR for $220) at Amazon (list price $229.99). Amazon Fire TV Stick 4K Wireless Media Streaming Device for $34.99 (Echo Dot Bundle for $60, Fire TV Recast Bundle for $235) at Amazon (list price $49.99). Amazon Fire TV Stick HDMI 1080p Streaming Player for $24.99 (2nd Gen Echo Dot Bundle for $40) at Amazon (list price $39.99). Amazon Fire HD 10 32GB 10.1" 1920x1200 WiFi Tablet for $99.99 at Amazon (list price $149.99). Amazon Fire HD 8 16GB 8" 1280x800 WiFi Tablet with Special Offers for $49.99 (3x for $134.97) at Amazon (list price $79.99). TWO 2nd Gen Amazon Echo Show 10.1" 720p Alexa-Enabled Touchscreen Device for $339.98 (Ring Video Doorbell Pro Bundle for $429) at Amazon (list price $459.98). TWO Amazon Echo Spot 2.5" Color Touchscreen Alexa-Enabled Smart Speaker for $159.98 at Amazon (list price $259.98). Amazon Kindle Paperwhite 6" WiFi eReader with Special Offers for $79.99 at Amazon (list price $119.99). Amazon Echo Look Hands-Free Camera and Style Assistant with Alexa for $49.99 at Amazon (list price $199.99). Audible Gold 3-Month Membership (New or Returning Users Only) for $6.95/month at Amazon (list price $14.95/month). iRobot Roomba 675 3-Stage WiFi Robot Vacuum (Works with Alexa) for $199 at Amazon (list price $229). Ring Video Doorbell 2 1080p WiFi Enabled Camera + 3rd Gen Echo Dot for $139 at Amazon (list price $248.99). Ring Alarm Home Security System 8-Piece Bundle with optional 24/7 Professional Monitoring for $188.99 at Amazon (list price $268.99). Blink Indoor Home Security Camera System 1 Camera Kit with Motion Detection for $66.99 (3 Cameras for $154, 5 Cameras for $234) at Amazon (list price $99.99). $33 Price Drop: iRobot Roomba 960 WiFi Robotic Vacuum for $415.99 at Amazon (Clip $33 Coupon - list price $699). iRobot Roomba 890 WiFi Vacuum Robot (Great for Pets + Up to 5x more power than 600 or 700-series) for $349.99 at Amazon (list price $499). iRobot Roomba 690 WiFi Robotic Vacuum for $249 at Amazon (list price $374.99). Ecobee4 WiFi Smart Thermostat with Sensor and Built-In Alexa for $199 at Amazon (list price $249). Netgear Arlo Wireless 720p Security Camera + Mounts (3-Pack) for $199 at Walmart (list price $299). Netgear Arlo Wireless 720p Security Camera Kit (4-Pack) for $249 at Amazon (list price $449.99). Google Home Mini Smart Speaker + Chromecast + $15 Vudu Movie Credit for $45 at Walmart (list price $74). Google Home Mini Smart Speaker + GE C-Life Smart Bulb for $31 at Walmart (list price $55). Google Home Mini Smart Speaker (2-Pack) for $50 at Walmart (list price $70). Google Home Max Smart Speaker for $350 at Walmart (list price $399). Lenovo Smart 8" Display with 10W Speaker, Camera, Google Assistant for $99 at Walmart (list price $199.99). Ecovacs Deebot N79S WiFi Smart Robotic Vacuum for $149.99 at Amazon (list price $299.99). Neato Botvac D3 WiFi Laser Navigating Robot Vacuum for $249.99 at Walmart (list price $399.99). Jabra Elite 65t Alexa Enabled True Wireless Earbuds with Charging Case for $119.99 at Amazon (list price $169.99). Bose QuietComfort 35 II Noise-Cancelling Wireless Headphones for $299 at Walmart (list price $349). Bose SoundSport Free Truly Wireless Sport Headphones for $169 at Walmart (list price $249). Sennheiser HD1 Active Noise Cancelling Wireless Bluetooth Headphones for $199.95 at Amazon (list price $399.95). Bose SoundLink Around-Ear Wireless Headphones II for $199 at Walmart and Amazon (list price $229). Cowin E7 Active Noise Cancelling Bluetooth Wireless Headphones for $49.99 at Amazon (use code: XZ3TJBWN - list price $68.99). Bluedio T6 Active Noise Canceling Wireless Headphones with 57mm drivers for $39.59 at Amazon (Clip $8 Coupon and use code: BLUEDIOT6S - list price $69.99). UE MEGABLAST Portable WiFi Bluetooth Speaker for $124.99 at Amazon (list price $299.99). Logitech Z906 5.1 Surround Sound Speaker System for $199.99 at Amazon (list price $399).